The ultra pure water IPC Eagle Hydro Cart uses a 4 stage filtration system, which includes reverse osmosis, and deionization process to produce mineral free water providing incredible cleaning action and spot free windows. Nothing will clean your windows faster. We have seen as much as a 75% increase in window cleaning efficiency with our deionized window washing systems. The hydro cart has the ability to produce a high volume of pure water on normal tap pressure. 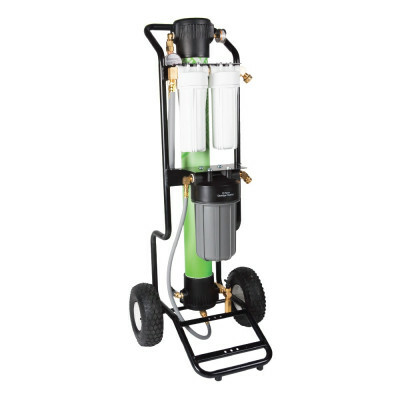 It is perfect for most applications, but can be ordered with an electric or battery powered booster pump, to increase productivity in low water pressure areas or when two-pole cleaning is desired. Please give us a call for special pricing! This Hydro cart is perfect for cleaning windows on taller buildings. If you're looking for something a little more economical, and can still do some upper levels of larger buildings, please take a look at our two story window washing kit. The Hydrocart can clean up to 3 story buildings with just standard tap water pressure. Add a pump to clean up to a five story building safely from the ground (no ladder needed). 4-stage pure water filtration ensures that all contaminants and particles are removed from the water. Tank-less system provides enough pure water for one pole cleaning, and a pump can be added to power 2 poles. The portable Hydrocart can easily be moved in and out of vehicles, up and down steps, and across any terrain. Includes 100' of industrial hose (no hose reel). Customers who were interested in the IPC Eagle Hydro Cart™ Reverse Osmosis Window Washing Cart were also interested in the following items. This is a review for the IPC Eagle Hydro Cart™ Reverse Osmosis Window Washing Cart.